right, at a meeting in San Lorenzo last month. After a series of community meetings showing a building consensus among local residents in opposition to a plan for the Alameda County Sheriff’s Office to operate the Ashland REACH Youth Center, Alameda County Supervisor Nate Miley decided Wednesday night to indefinitely pull the plug on the proposal. Under the original timeline, the turnover between agencies was scheduled for this July. The youth center, which opened in 2013, gives an outlet to county teenagers and young adults, in addition, to access to various health services. Miley made the announcement in a two-page letter distributed at a community meeting in Hayward. The District 4 supervisor expressed gratitude toward the outpouring of concern over the future of the youth center. “I have been moved to learn how many people care deeply about REACH and I appreciate that people are willing to come out and share their feelings with me,” he wrote. Miley said the conversation with constituents, including well-attended meetings in Oakland and San Lorenzo, “reshaped” his views about switching operators. 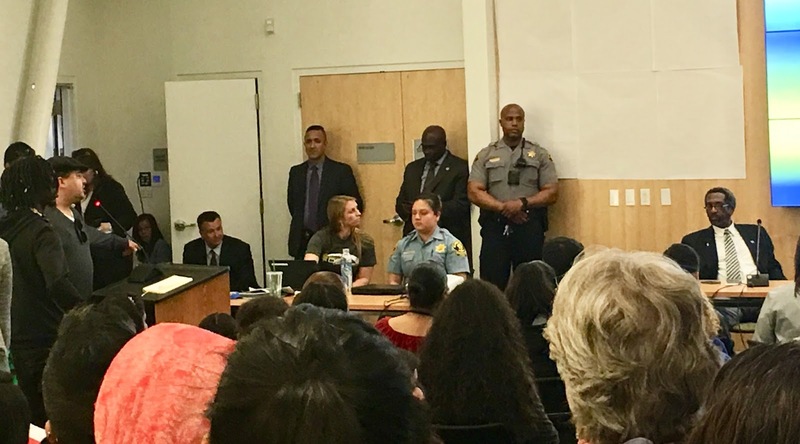 During the meeting at the San Lorenzo Library, the thought of the Sheriff’s Office operating the youth center was unfathomable to many. “This is an insane idea,” said one activist who opposed the proposal. Distrust among some minority groups and immigrants toward the Sheriff’s Office fueled a vast majority of the concern over Miley’s plan. While the youth center is located in the heart of unincorporated Alameda County, it also draws visitors from neighboring San Leandro and Hayward. Some elected officials in those cities voiced skepticism to Miley’s original proposal. Miley first announced his intention for the Sheriff’s Office to takeover operations of the Ashland REACH Youth Center last December. Over the next few months, opposition gradually built in the unincorporated areas, leading to a series of community meetings and additionally meetings with local stakeholders. Posted in Alameda County, Alameda County Board of Supervisors, Alameda County Sheriff, Ashland REACH Youth Center, health care, Nate Miley, Oakland, unincorporated, youth center. Bookmark the permalink.